Folkestone based corporate stationery experts, Noted in Style, are delighted to have been appointed the first ever ‘official branding partner’ to Paperblanks Journals. 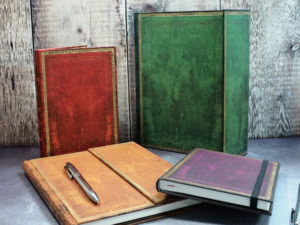 The partnership sees Noted in Style become the exclusive supplier of customised Paperblanks journals for corporate customers across the entire Europe, Middle East and Africa regions. Paperblanks, part of the Hartley and Marks Group, produce decorative journals inspired by the works of the world’s greatest artists and the heritage of traditional craftsmanship. Keen to expand further into the corporate market, Paperblanks trialled a number of branding houses across Europe and found Noted in Style’s production quality and customer service levels to be the best. Marketing & PR Manager, Emilie Langlade, commented that Noted in Style is “a company whose core principles align with ours, provide excellent quality products alongside fantastic customer service. They endeavour to be exciting, creative, passionate and to have integrity – values they have proven to encompass time and time again”. Specialists in the design and customisation of notebooks, journals and diaries for the corporate market, Noted in Style combine traditional print techniques and hand finishing with modern digital technology to produce creative products for their clients. They work with companies from all sectors and the quality of their work has won them an enviable client list, including household names such as Adidas, Google, BAFTA and HSBC. Creative Director, Gerald Glover, expressed his delight at the new partnership stating “having always been inspired by the Paperblanks collections and the quality of their products, it’s now fantastic to be working with them as their EMEA branding partner”. Both parties are looking forward to the exciting growth of Paperblanks journals within the corporate stationery market.